The No.4 is evenly balanced for a small cigar, well structured, whilst still offering excitement to the palate. Flavors of cocoa, coffee and dried fruit are blended together with a medium tobacco taste giving an impression of true balance. You will never get tired of this Petit Corona, which is why this is the perfect example of a companion cigar. 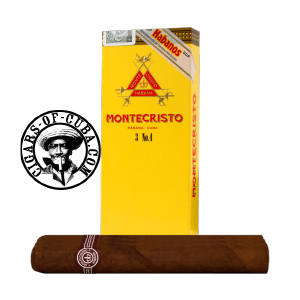 This petit corona rivals its popular brother, the Montecristo No.2, in taste. Regularly, the highest selling Cuban cigar in the world. Regularly, the highest selling Cuban cigar in the world. Flavors of cocoa, coffee and dried fruit are blended together with a medium tobacco taste giving an impression of true balance. Don't get caught out be the strong finish.